Many people with Pyruvate Kinase deficiency require regular blood transfusions, but it depends on the severity how much they need. Some patients can go years without a transfusion, while other patients may need one as frequently as every three weeks. It’s common for a newborn baby with PKD to be transfused shortly after birth due to severe anemia. In order to remove the large amount of bilirubin (the waste product of red blood cells), the newborn may require an exchange transfusion. Presently, ther e are no clear transfusion guidelines for Pyruvate Kinase Deficiency. Some doctors wait to transfuse until the patient’s Hb is below 6,4 g/dl (64 mg/dl / 4 mmol/l), while others prefer to maintain an Hb of at least 9,6 (96/6) or even as high as normal. Many doctors will base the transfusion decision on how the patient is feeling, rather than looking strictly at the hemoglobin numbers. So, at this time there is no definitive answer as to when a patient with PKD should have a transfusion. It is believed that patients with Pyruvate Kinase Deficiency adapt to a low hemoglobin level through a rise of 2.3DPG. However, it is important to note that everyone’s body is different, and some may be better able to compensate at lower levels than others. Age is also a factor that may influence how well a patient with PKD functions at very low hemoglobin levels. Some patients have found that with increased age, maintaining a higher hb level has improved their quality of life. A blood donor is screened when they wish to donate blood. The donor may be given a short physical exam to ensure that making a blood donation will not present any dangers to the donor’s health. A variety of questions will be asked to help ensure the safety of the blood to the recipient. Once the donor is approved, the blood is donated and then evaluated for transfusion-transmitted diseases ( HIV, hepatitis, etc.). Then the blood will be processed and split into 3 part: plasma, platelets, and red blood cells. After this process the different components will be stored until it is needed by a patient. In 1901, Karls Landsteiner (1868-1943) discovered that some people died from getting a blood transfusion and others didn’t. He wanted to know why this happened and started to study the actual blood of people. He discovered that there were some people who had antigens on the red blood cells and others who did not. He called those antigens phenotypes, and he called the different phenotypes: A, B, AB and O. He also discovered that someone with phenotype A makes antibodies to phenotype B and phenotype O made antibodies to both A and B. The reaction that those antibodies created was that the blood started to clot. This is called agglutination and is the reason why people died many years ago while receiving a blood transfusion. To illustrate this phenotype-system you can see in the chart which blood type you can receive blood from (row) depending on your blood type (column). For example, if you have blood type A, you can receive blood from blood type A and O. The Rhesus factor is also called the D- antigen, but besides the D-antigen there are many antigens that can occur on top of the phenotype. When a person is Rhesus –, it means that there are no extra antigens. Rhesus + means antigens are present. A person with blood type A- cannot receive A+ blood for exactly the same reason why phenotype A cannot receive phenotype B blood. It will cause agglutination of the blood. In some cases a person with A+ blood will be only receiving A- blood because it does have a D-antigen but will react strongly to one of the other many antigens. In total there are more than 300 different blood types in the world. To prevent an agglutination of the blood, the blood type (ABO) and the rhesus factor (-/+) of the patient will be identified before having the transfusion. Through a blood test, the blood of the patient will be cross matched with the donor blood to see whether it will fit the body. Both blood samples (from the donor and from the patient) will be joined together in a test tube. If after one hour no agglutination reaction occurred, the donor blood is assumed to be compatible and a safe transfusion will be possible. To administer the blood, the nurse will use a needle which contains a small flexible tube. When the needle is correctly placed in the vein, it will be distracted and the small flexible tube will stay in the vein. First the nurse will give some sodium-chloride to get the transfusion going. When the blood arrives it will be hung on an IV pole and connected to the tube. How fast the blood flows into the body depends greatly on how much the patient can handle. Most of the people will do 1 unit within two hours, but for some it is better to slow it down and do 1 unit in 3 or even 4 hours. With people with Pyruvate Kinase Deficiency, there is enough fluids in the body but not enough red blood cells. For some people getting a transfusion and therefor extra fluids will give a feeling of being too full. This can lead to headaches, feeling tired and even sick. For this reason a diuretic medicine can be prescribed to get rid of the extra fluids. This medicine can be administered through the infusion but can also be given in tablet form. It will not destroy the new blood cells, but will get rid of the extra volume that is now in the body. In some cases the patient really feels that the heart needs to work extra hard to pump all the extra fluids around. When this happens, it is important to mention this to the doctor. Maybe the blood is just running in too fast and a slight change will make the patient feel a lot better. The blood that is given to patients with PKD needs to be extra safe. Some viruses cause haemolysis of the blood. One of those viruses is the parvovirus. The blood for patients with PKD needs to be parvo-free for that reason. Some doctors prescribe washed or extra fresh blood for those patients who are getting regularly scheduled transfusions. When the blood is washed it means that it is cleaned to rid the blood of as many viruses and foreign items as possible. There is only a small number of patients who receive this extra processed blood. When a baby is extremely jaundiced, the doctors might prescribe an exchange transfusion. This means that the baby will receive blood at the same time as they will extract blood. The reason for this is that the blood within the body of a baby with PKD is not good and will be broken of fast into bilirubin which causes the yellow coloring of the skin. When the child is already very jaundice, the bilirubin is too much for the little body to handle and for that reason the doctor can prescribe an exchange transfusion. Are there any risks with a blood transfusion? 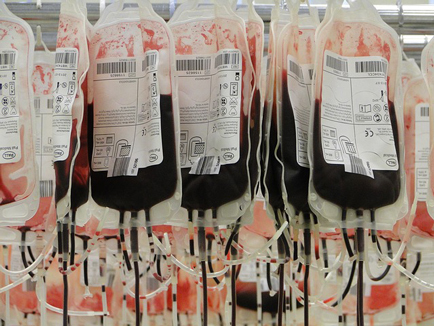 In the modern world, the risks of a blood transfusion are getting smaller. The blood will get tested for infectious diseases and within the cross match, the laboratory will check whether the blood will fit with the patients’ blood. Nevertheless, the hospital will check the patient’s function during the transfusion, to see whether a reaction is occurring. The nurses will check vital signs like blood pressure, temperature and heart-rate. When there is a significant change within several minutes after the first blood going in, the nurse will stop the transfusion and consult a doctor. It can happen that a reaction occurs hours or sometimes even days after the transfusion. It is very rare, but a patient that feels sick hours after a transfusion should immediately be seen by a physician. In countries where there are less facilities to check the blood before it is administered, there is more risk that infections and reactions will occur. When travelling to a foreign country, it is important to check what the health facilities are like in that country. Every blood unit contains about 250 mg iron. Under normal circumstances, this iron won’t cause any problems. But when having repeated blood transfusions, the iron will accumulate in the body, causing an iron overload (also called hemosiderosis). Because the body isn’t able to eliminate the iron overload, toxic iron levels at the tissues will be reached after around twenty blood transfusions. This can cause damage to the liver, the heart and the endocrine organs. Read more about the iron overload and it’s treatment by chelation therapy.